Two similar designs of the tech 1 era are the Thunderbolt, and the Orion. Their standard versions seem to be a part of a family of mechs that use a similar, but not identical weapons profile. In debate I have found that the Thunderbolt ranks among the most respected mechs of the tech 1 era, the Orion seems to go more by the player, with many esteeming it, while others respond differently. When you look at these two mechs from an intro tech perspective, can you tell me their primary roles, how do they compare, and contrast in performing their roles, and why you prefer whichever you do? Keep in mind that many mechs perform better on the mapsheet, than their printouts might presume. Feel free to speak about various other tech 1 variants, as they add quite a bit of spice to this discussion. You do not have to cover every aspect, just speak about what you want to. Well, both are Brawlers. I would say the Thunderbolt has the edge at long range and handling it's heat. The Orion is pretty good up close. Both run pretty hot though. While i think the Thunderbolt is probably the better mech, I prefer to play the Orion as I think it just looks cooler. In fact in the current campaign I am playing, when I was building my mech company I swapped out the Thunderbolt for the Orion, just to paint up the mini. The main function of the Orion, in my opinion, is so you don't have to field all Thunderbolts. The venerable T-Bolt is one of the most effective units in the game in terms of firepower and armor for the tonnage, carrying better protection than some Assault 'Mechs at least 20 tons heavier. The LRM-15 rack gives it respectable ranged firepower, although not quite enough to compete with dedicated fire support designs. Up close and personal, it can deliver a LL, 3xML, and 2xMG (27 potential damage) while walking, and still not build enough heat to suffer a movement penalty the next turn, or throw in the SRM-2 rack for another 2 heat and a movement penalty. Loaded with Infernos, that can seriously degrade the performance of most other intro-tech designs, and the MGs give it anti-infantry capability. In short, it can do everything reasonably well except scout. While it carries a distressing amount of ammo, that's fairly well padded by other internal equipment, so MOST players don't see explosion issues with any regularity (a few obviously have different luck). There's a jump-capable version at the expense of other options, for those who want to take advantage of that. The Orion would be an impressive infighter/brawler if not for the severe shortage of heatsinks, with an LRM-15 rack (as with the T-bolt) to reach out and touch something before it gets there. The AC/10 exceeds the damage potential of the T-Bolt's LL, but is ammo dependent, so you need to be slightly more cautious about its use. The short-range armament comes down to 2xML and different numbers of SRM/4 racks mainly at the expense of armor, depending on the version. Like the T-bolt, it has a significant number of ammo slots, which in this case are slightly less well padded. Depending on version, it may carry significantly less or slightly more armor than the T-Bolt. Given the choice, I'd generally take a T-Bolt over an Orion, but only by a fairly small margin. I'd put money on the T-bolt in a duel between them, even though the Orion can do quite a bit more physical damage. I am going to focus on a specific variant. There are some other ways of thinking of the V. If an ON1-V is escorting a pair of Longbows and an Archer, it has enough short range power to make opportunists think carefully, and maintains a low enough profile to where its armor is not in immediate sight. In a battalion game I could get away with it, because Griffins would throw in some screening shots against opportunists. It is also a bully against some mediums, and lower end heavies. The inattention to the heat curve seems puzzling, so I am guessing that this one assumed that approaching mechs would already have holes, or that it could choose between the autocannon, and second launcher. Movement heat is not an immediate issue for the Orion much of the time, as it often ends up in static positions, backing units like the Warhammer, and Archers, until they need to move; if an opponent tries to force movement, it is up to the user's discretion, as well as situation demanding how one ought to respond. There is not always a clear answer to such situations. An Orion can lead a line, but I do not think the V had that in mind, except when it is the bully. I do not think the V is a great variant, nor do I think much practical thought was put into it by the designers. I do think it is playable, with a systematic thought process. Ammo dependency rarely becomes an issue for an Orion. 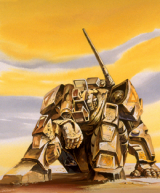 I really don't understand the fondness of T-bolt over another heavy mech in the Succession Wars period. The 5S is a great mech that can do pretty much anything except scout. The issue I have with it is it is a walking ammo bomb with ammo in the LA and RT. Aside from the head, it makes sense to store armor in the CT because it is the most armored location and aside from random crit if you are rolling for crits on the center torso you probably are near death anyhow and should leave the battlefield. The 5SE and 5SS are okay due to the fact they can both manage heat exceptionally well, but neither can do enough damage outside of 9 hexes to cause a PC. The Orion on the other hand isn't energy dependent. If there isn't a campaign and ammo reloads a concerns I see no reason not to take it over a Thunderbolt. The AC/10 and LRM-15 combo is decent damage for the era. There isn't a need to have more than 10 sinks to deal with the heat. Heat is a bigger concern if an engine gets hit, but again its manageable. While one should be retreating at that point it can still put up a fight. Ammo is in the torsos on the 1K along with a sizable amount of weapons so there is a lower chance to hit ammo as compared to the 5S. I look at the other Succession wars Orions as niche death traps, much like the Thud 5S. So on that basis it is largely an Orion 1K for me every day of the week where I can't a Warhammer 6D or an Awesome 8Q. The introtech thunderbolt is a mech that needs to be used intelligently. Despite that, cooling off is easy, just don't use the LL in close. Under current rules I don't like the SRM-2, but under older rules the infernos (SRM-2 only) were what let the mech compete right up there with some assaults. The introtech Orion is a mech that needs to be used intelligently and with discipline; you've got four close-range 3-heat weapons plus movement heat, and only 10 sinks. Deciding when to use all four, only use three (And which 3) and when to cool down requires constant judgement calls. seems to me that the Thunderbolt is a bit more useful at point blank range, it can still fire everything except the LL and MGs while punching, with actual hands. The Orion ON1-V is going to struggle with heat management, and kicking is really it's only option if it ends up in a melee. projects damage better and can take more damage . If that isn't possible-the Thud is more versatile . mounted large laser on one side and MGs in the other . Against combined arms-the Thud is better . so I don't use them . I also tend to play my units from a team perspective . field an Archer 2R and a Warhammer 6D .